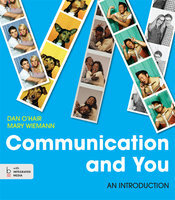 The bestselling authors of Real Communication, Dan O'Hair and Mary Wiemann, have done it again. Communication and You maintains the lively, real life examples, the accessibility, and the breadth of human communication coverage seen in Real Communication—with a new focus on student application and self-assessment. The authors’ great read is paired with a simplified feature program that prompts students to measure concepts against their personal experiences while also examining the influences of technology, ethics, and the culture around them. Taking self-assessment a step further, Communication and You comes with access to LearningCurve, a game-like, adaptive learning program containing more than a thousand questions written specifically for the book. This personal focus, along with an attractive, 2-color design and a low price, make Communication and You a great learning program and a value for students and instructors alike.